Essel Group Chairman, Subhash Chandra was awarded the The Hall of Fame for Continuing Contribution to Industry (Entrepreneur) at the annual Exchange4media Indian News Broadcasting Awards (EINBA) 2010, held in Delhi on September 1. The EINBA awarded excellence for work and achievements during the period between April 1, 2009 and March 31, 2010. Awards were given away in 26 categories in the third edition of EINBA. Accepting the award Mr. Chandra said, The industry has come a long way over the last 20 years, from the time when Zee TV used to telecast half an hour news bulletins. The country has over 250 news channels now. He was accepting the award on behalf of all the professionals who had worked with Zee News as well as those currently employed by the channel. The winners were chosen by a jury comprising of the most eminent personalities who understand media and TV news media. 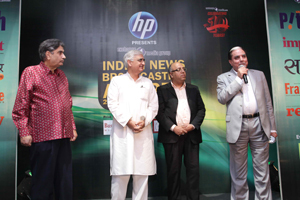 Vinod Mehta, Editor-in-Chief, Outlook Group was Chairman of the jury. The other jury members included: Tarun Basu, Director and Chief Editor, IANS; Hormusji N Cama, Director, Bombay Samachar and past President, INS; author Mukul Kesavan; Shiv Mukerjee, Former Diplomat, High Commissioner to the UK; social activist Sabrina Lall; Shashi Shekhar, Editor-in-Chief, Hindustan; Jwalant Swaroop, Director - Ad Sales, Lokmat Group; Sunil Vysyaprath, Executive Creative Director, Wieden+Kennedy; and Hoshie Ghaswala, President - Publishing, Cyber Media India Ltd.